Prolight Concepts has released the Equinox Fusion Spot, a moving head fixture that utilises a bright 12W white LED source, separate GOBO and colour wheels, and a narrow beam angle to give mobile DJs access to coloured moving beam effects that bring energy to the dance-floor. The unit is incredibly compact, but is still packed with features, making it ideal for use as part of a mobile lightshow. 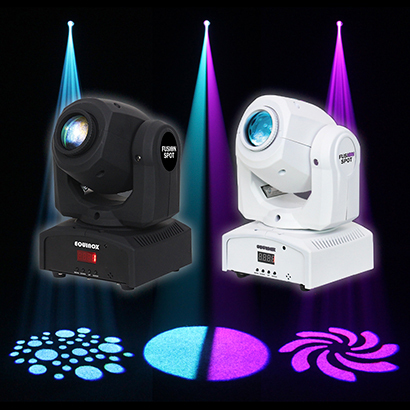 Equinox has equipped the Fusion Spot with a GOBO wheel with seven GOBOs (plus open) and an independent colour wheel with seven colours (plus open), allowing users to create various combinations of pattern and colour. These projections are made bright and concise thanks to the unit’s 12W white LED source and 13&#8304; beam angle. In addition, the Fusion Spot boasts 540&#8304; pan and 270&#8304; tilt, making for flexible movement that enables mobile DJs to fill any venue or dance-floor with moving beam effects. These coloured effects can then be enhanced, thanks to the fixture’s variable strobe, the intensity of which can be controlled using 0-100% dimming. With three control options to choose from, mobile DJs can use the Fusion Spot as a plug-and-play fixture, using the Auto and Sound Active modes, with four in-built shows, or achieve more in-depth control using DMX, with the choice of 1, 8 and 10-channel modes. Multiple units can also be run in master/slave mode for easy to set up synchronized lightshows. The rear of the Fusion Spot features a four-button menu with LED display, for easy mode and option selection, and three-pin XLR in/out sockets. The fixture also comes supplied with a hanging bracket, so DJs can mount the Fusion Spot above the dance-floor, or anywhere else in a venue, to achieve overhead effects, with which to keep audiences entertained, or static spotlighting to enhance event or venue features. Both weighing in at 2.5kg, the Equinox Fusion Spot and Fusion Spot (White) are lightweight and compact, making them ideal for DJs looking for a moving head spot that can be taken on the road as part of their mobile setup. The Equinox Fusion Spot from Prolight Concepts is available now.